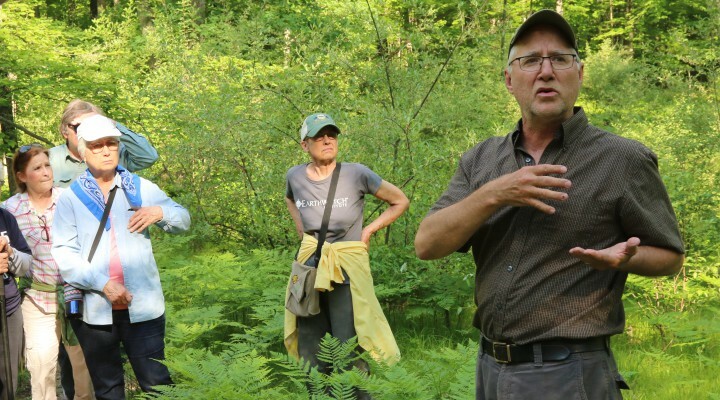 On Friday, June 8th, more than 25 participants were led on a guided hike at Bundy Hill Preserve by Dr. Fred Heck, Professor of Geology at Ferris State University. Hikers got a taste of the new trail system currently under construction on the preserve. When complete, the preserve will offer just under two miles of winding hiking trails around the tallest point in Isabella County. Geology topics broken down by Dr. Heck included the interesting Michigan Basin, glaciation, rock and soil types on the preserve and the area’s unique topography. Bundy Hill — at 1,270 feet — is about 500 feet higher in vertical elevation than the center of Mt. Pleasant. Photos by Karen Green and Stan Lilley. Muriel Straight’s Name is on the Map!